The 1973 French Grand Prix, otherwise known officially as the LIX Grand Prix de France, was the eighth round of the 1973 FIA Formula One World Championship, staged on the 1st of July at the Circuit Paul Ricard. The race, which marked the halfway point in the 1973 season, would be remembered for a race deciding collision that effectively handed Ronnie Peterson a maiden race victory. Qualifying saw Jackie Stewart claim pole position, the Scot knowing that victory would put him into the lead of the Championship with seven races left to go. He was joined on the front row by the youthful Jody Scheckter and current Championship leader Emerson Fittipaldi, who was looking for a strong result after a poor run of luck and form. The start of the race saw Scheckter shoot into the lead, trailed by an equally fast starting Peterson, up from fifth on the grid. Stewart got away in third ahead of Denny Hulme, while Fittipaldi filtered in behind as the top five quickly sprinted clear of the rest of the field. It took until lap sixteen for any changes to affect the leaders, with Hulme dropping out of contention with a slow puncture. He was joined by Stewart a few laps later, although neither managed to lose a lap while having their flats replaced, leaving just three cars in the fight for victory. Fittipaldi was determined to take advantage of Stewart's problem, his bid aided further by the rather generous decision of teammate Peterson to wave him through to second. The Brazilian then set about attacking Scheckter, launching a dive down the inside of the South African when the rookie hesitated while trying to lap Jean-Pierre Beltoise. Unfortunately Scheckter decided to dart past Beltoise at the same moment, meaning the Lotus and McLaren smacked together, leaving both to limp back to the pits with terminal damage. All of that left Peterson with a huge advantage over the rest of the field, with the Swede duly cruising home to claim his first World Championship triumph. François Cevert had a quiet drive to second ahead of Carlos Reutemann, while Stewart recovered to fourth, taking the lead in the Championship. Jacky Ickx claimed fifth for Ferrari while James Hunt came across the line in sixth, a maiden point the reward for both himself and Hesketh Racing. After the brief stop in Sweden the F1 circus was heading back to the Mediterranean coast, this time to use the Circuit Paul Ricard. The Circuit Paul Ricard was relatively new to the racing scene, having debuted as the host of the French Grand Prix back in 1971, and remained unchanged for its second attempt. Indeed, the purpose built facilities encouraged a huge entry list to be submitted for the race, 28 cars being submitted, with a feast of other series in attendance to support France's biggest motorsport event after the 24 Hours of Le Mans. At Lotus it was business as usual, with Emerson Fittipaldi and Ronnie Peterson arriving in France with a full compliment of cars at their disposal. Arch rivals Tyrrell were in a similar position, having their familiar trio of wheels on hand for Jackie Stewart and François Cevert, although all were carrying scars from the battle in Sweden. Those four would once again start the weekend as favourites, with murmurs of discontent from the lower orders, who believed that these four were being given special engines from Ford Cosworth. At McLaren there was an enforced change, for Peter Revson was away to take part in a USAC race in the United States, meaning Denny Hulme would get a new partner for the weekend. Indeed, the team were forced to bring in youngster Jody Scheckter to fill the second seat, with the South African racer making his third start in France. He would get complete parity with Hulme for the first time, and many were eager to see if his promise would be fulfilled in the front running McLaren M23. Elsewhere, Brabham were up to full strength, with Carlos Reutemann and Wilson Fittipaldi in action again, both getting complete rebuilds ahead of the blast in France. The third "pseudo-works" car of Andrea de Adamich was back to support them, with the Italian set to be supported by a teammate of his own, until young prospect John Watson injured his leg in a testing accident prior to the weekend. The Ulsterman was set to race in the following British Grand Prix, leaving Brabham with two "new" and two "old" cars at Paul Ricard. March made an enforced change to their works effort, Jean-Pierre Jarier being partnered by Reine Wisell in the semi-works car, the Swede getting a second shot at Grand Prix racing after Mike Beuttler injured himself in an Formula Two crash prior to the weekend. Joining them would be the customer cars of LEC Refrigeration Racing and Hesketh Racing, fielding David Purley and James Hunt respectively after both missed the scramble in Sweden. Yet, the March quartet would not arrive in France in the same spec, for Lord Hesketh had decided to develop his car using his own money, tempting Harvey Postlethwaite to quit the factory effort and join the young privateers. At the Frank Williams Racing Cars run Iso-Marlboro effort the search to find a replacement for Nanni Galli was on, with Henri Pescarolo drafted in to fill the second seat alongside Howden Ganley. Ferrari were back up to their full compliment again, Arturo Merzario getting his car rebuilt in time to rejoin Jacky Ickx, although their hopes were hampered by the outclassed F12 engine in the back. BRM were in a similar position with their V12 powered trio of Clay Regazzoni, Jean-Pierre Beltoise and Niki Lauda, with the F12 Tecno effort failed to materialise as the team fell out with title sponsors Martini. Completing the field were Shadow, who were able to field their two factory cars for Jackie Oliver and George Follmer as usual, with Graham Hill's car rebuilt in time for the weekend too. Surtees were also at full operating strength, Mike Hailwood and Carlos Pace entered as usual, while team boss John Surtees decided to enter himself in the experimental third car. The final entry on the list was that of Ensign, who finally managed to arrive at Grand Prix with their car, although very little was expected of them and F1 debutante Rikky von Opel. Another retirement for Fittipaldi had allowed Stewart to close the gap even further in Sweden, although the Scot's late race problem meant that the Brazilian still held a two point advantage at the top of the World Championship standings. Cevert had made ground on the pair of them with another podium finish, but was still fourteen points behind teammate Stewart, while Hulme had overtaken teammate Revson with his Swedish victory. Ronnie Peterson was up to sixth, having leapfrogged the two Ferraris. The Lotus-Ford Cosworth/Tyrrell-Ford Cosworth battle at the top of the International Cup for Manufacturers' standings had seen the latter's lead cut to two points, both teams looking set to break through the 50 point mark for the opening half of the season. McLaren-Ford Cosworth had secured themselves in third with Hulme's victory in Scandinavia, while Ferrari were finally up to double figures in fourth. Brabham-Ford Cosworth, BRM, Shadow-Ford Cosworth and Tecno completed the scorers. Practice/qualifying would be divided into three sessions for the French Grand Prix, with a two hour run on Friday afternoon followed by similar length sessions on Saturday morning and early evening. The six hours of practice would allow teams to find a balance between top speed and cornering pace, a crucial decision given the unique layout of the Circuit Paul Ricard and its excessively long back straight. As for target times the "Aces" of 1973 were all expected to beat the qualifying record of 1:50.71, set by Jackie Stewart as he took pole back in 1971. The circuit record stood at a 1:46.40, set in a Can Am car by Mark Donohue. The first session on Friday saw a lot of experimentation, although it seemed as if Tyrrell had perfected their setup before they even managed to turn a wheel in anger. Indeed, Stewart looked to be in unbeatable form the moment he hit the track, lapping close to his circuit record after just a handful of laps, with teammate François Cevert not too far behind. By the end of the session the Scot was flying, a 1:48.37 registered by the timekeepers handing him provisional pole, although the rest of the field had recorded the #5 car in the 1:49.00s. Stewart ultimately proved to be the only driver under the 1:49.00 mark, with teammate Cevert second fastest with a 1:49.39. Only Ronnie Peterson and Denny Hulme joined the Frenchman in the 1:49.00s, with everyone else struggling to break the 1:50.00 barrier. Elsewhere there was very little to analyse, despite a day almost completely clear of reliability issues. Saturday morning saw the track temperature around half of what it had been at the end of Friday, meaning it was difficult for the top drivers to improve. Hulme ended up fastest, three hundredths down on his Friday best, although as that had been set in his spare it would be the Kiwi's 1:49.68 that ended up as his qualifying time. His teammate Jody Scheckter was one of those to improve, climbing into the provisional top five, while Stewart failed to get into the 1:49.00s at all. Elsewhere there were improvements for Championship leader Emerson Fittipaldi, finding a second overnight, while Carlos Reutemann caused a stir when he put the Brabham on the verge of the 1:49.00s. At the lower end of the field there were mixed results, Shadow seeing their factory cars beaten by the customer effort of Graham Hill. At Surtees, meanwhile, there were murmurs of discontent for Carlos Pace, his car being the first to suffer a major failure in France, with the Brazilian taking over the spare car which John Surtees himself had been entered in, although the Brit ultimately decided against leaving the paddock. The final session on Saturday afternoon saw temperatures on the rise, with the majority of the field setting late laps to jumble the order. The exceptions to this rule were the Tyrrells who both failed to improve, prompting several teams to protest against Stewart's Friday time, given the disparity between the timekeepers and team results. Yet, there would be no threat to the Scot on the track, despite the best efforts of those behind. The man to put together the biggest challenge to the Scot was Scheckter, who was now fully up to pace with the race winning McLaren M23. The South African flew round Paul Ricard to record a 1:49.18, taking him to second on the grid just moments after Fittipaldi had taken the spot having finally settled on a setup. It was a lap that could, and most likely should, have put young Scheckter on pole, although the organisers quickly upheld Stewart's time once qualifying was over, leaving the South African sandwiched between two World Champions on the front row at only his third race. T Indicates a driver used their test/spare car to set their best time in that session. Raceday dawned bright and warm, with temperatures hitting new heights ahead of the 3:00pm start time, with a huge crowd swarming to the circuit with the promise of free tickets, although a grand stand seat did cost a fair amount. As for the combatants there were no issues during either the warm-up session or parade laps, before forming on the dummy grid. The field then proceeded to pull onto the grid proper for the start, Arturo Merzario being left behind as he struggled to get his Ferrari restarted, although the Italian did manage to get into a position before the starter's flag fluttered. There were attempts to try and force the starters hand by a few of the drivers, although those who tried would all be caught flatfooted by the young South African on the front row. Indeed, as Carlos Reutemann marginally jumped the start, Jody Scheckter reacted brilliantly to the drop of the starter's flag and shot into the lead, quickly followed by Ronnie Peterson, who took advantage of the abandoned space in the middle of the front row to slot in behind. Jackie Stewart and Denny Hulme followed him through with Emerson Fittipaldi dropping to fifth, while Reutemann checked himself up as the rest pulled away, meaning he slipped behind François Cevert. Scheckter was putting together a masterful display out front, the McLaren crossing the line to complete the opening lap with a small advantage over second placed Peterson. Indeed the Swede, and the rest of the top five, were simply trying to keep up with the flying South African youth, while Cevert and Reutemann were already fading into the background. They were left to head the rest of the runners across the line, being hounded by Jacky Ickx and Jean-Pierre Jarier, while Jackie Oliver retired at the very back of the field with a gearbox failure. 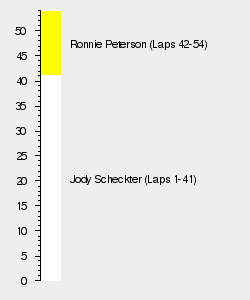 After the opening bout the order began to settle, with Peterson and co. edging closer and closer to the back of Scheckter, but were unable to make a move. The lead quintet were continuing to move further and further ahead of the rest, with Cevert forming a bottle neck for the rest of the pack. At the very back came Rikky von Opel in the debuting Ensign, which was proving reliable if nothing else, while Jarier became the second retirement of the day with drive shaft failure. After seventeen laps it seemed as if nothing was going to change out front, with Scheckter not really being challenged by the pack behind, who were all so close in terms of pace that no one could effectively make a move. Then, Hulme disappeared from the quintet, limping into the pits with a puncture, although the Kiwi decided to switch to a harder set, believing the cause of his issue was excessive tyre wear. He would emerge at the back of the leading quartet a lap later, with many missing the fact that he had lost a lap at all. Three laps later and there was another change, this time coming when Fittipaldi managed to edge his Lotus up the inside of Stewart at the end of the back straight, promoting him to third. A lap later and Peterson moved aside, a mutual Lotus agreement having been made that the Swede would allow Fittipaldi past to attack Scheckter, whom was proving far more resilient than any predicted. Peterson's decision was also particularly dangerous as it should have allowed Stewart to move past too, but the Scot was suffering from a slow a puncture and would limp back to the pits at the end of the lap. The Scot rejoined down in thirteenth in the midst of a rather spaced out field. By this stage the lead trio were beginning to lap the tail enders, although even that factor was not enough to throw Scheckter, who continued to swat away the attacks of the two Loti behind. Their progress through the backmarkers was also aiding Hulme, who was still glued to the top three after his stop and knew that every time they blasted past a slower car it dragged him up the order. As this was going on an interesting scrap was developing behind them, with Stewart's charge prompting Ickx to push onto the back of Reutemann, those three now battling for the tail end of the points. Half distance flew past with Scheckter still in the lead, and as the laps ticked past it seemed as if the South African racer was destined for victory. Then, on the 42nd lap the #8 McLaren pilot finally made a mistake, hesitating while attempting to lap the BRM of Jean-Pierre Beltoise. Having caught the Frenchman at the entry to the final corner, Scheckter decided to follow him through at the cost of some pace, prompting Fittipaldi to throw his car up the inside of the pair of them. Unfortunately the South African was just coming across to the inside of the corner, hoping power out of the corner and take the BRM on the exit, a move which carried him straight into the path of the lunging Brazilian. Fittipaldi's front left duly slammed into the side of Scheckter's cockpit before their wheels interlocked, the latter contact enough to throw the McLaren into the air. Amid a cloud of dust Scheckter crashed back to earth of the curb, an impact that proved terminal for his front suspension mountings, while Fittipaldi skidded to a stop on the exit with a ruined front left corner. Shooting through the dust cloud would be Hulme, suddenly on the lead lap after the accident, with Peterson right on his tail, the Swede inheriting the lead. Realising this, and with a monumental advantage over the now second placed Cevert, Peterson eased his pace, allowing Hulme to roar off into the distance. Scheckter briefly entertained hopes of catching him before realising that his car was fatally wounded from the accident, with the rather dejected South African racer pulling into the pits at the end of the lap. With that interest in the lead of the race all but disappeared, although a dispute between Lotus and McLaren in the pitlane quickly descended into name calling and set piece statements, much to the amusement of those not involved. On track the attention instead focused on the developing Reutemann/Ickx/Stewart fight, with the Belgian catching the Argentine, while the Scot closed in on both. As this was going on James Hunt quietly entered the top six, the Brit's March running strong and avoiding the chaos ahead, although Hulme was rapidly closing in on the top ten as the race entered its final throes. Back with the third place battle and with three laps to go Stewart was on Ickx's tail, sending a his Tyrrell down the inside of the Ferrari into turn one, much to the Belgian's frustration. The move left the Scot right on the tail of Reutemann's Brabham, although the Argentine racer was enjoying himself, despite a self induced spin earlier in the race. Stewart would proceed to throw everything at him as the trio started the final lap, aided by the fact that Ickx had decided to simply wait for an opportunity rather than make one for himself. Yet, outfront, Peterson was cruising, and duly collected a surprise, and rather anti-climatic maiden victory, forty seconds clear of an equally lonely Cevert. Third place then went to Reutemann, who fended off a late dive by Stewart into the final corner, the Scot falling shy of the podium by just half a second, while Ickx trailed the pair by two seconds. A thirty second wait then followed before a jubilant Hunt crossed the line in the Hesketh Racing March, claiming his first Championship point, with Hulme crossing the line a few moments later in eighth, just behind Merzario. Niki Lauda was the last of those to finish on the lead lap in ninth, with Graham Hill getting a season best finish of tenth, ahead of the other BRMs of Beltoise and Clay Regazzoni. They were followed by a lowly Carlos Pace, his race having been destroyed by two visits to the pits for fresh tyres, while Howden Ganley had limped his Iso-Marlboro home in fourteenth. Fifteenth went to the joint debutantes von Opel and Ensign, both shocked to finish their maiden race, while Wilson Fittipaldi was classified in sixteenth, despite a late gearbox failure. * Wilson Fittipaldi was still classified as despite retiring before the final lap. Debut for Team Ensign as an entrant and constructor. Rikky von Opel made his Grand Prix debut. von Opel also became the first (and so far only) World Championship starter from Liechtenstein. Maiden win for Ronnie Peterson. Lotus earned their 51st victory as a constructor. Engine partners Ford Cosworth claimed their 59th win. Carlos Reutemann claimed a maiden podium finish. First points finish for James Hunt. Jackie Stewart moved to the top of the standings with his fourth placed finish, overhauling the fuming Emerson Fittipaldi who had led the Championship since the start of the season. François Cevert continued to cement himself in third ahead of Ronnie Peterson, who climbed ahead of Denny Hulme with his maiden victory. Elsewhere, a sixth place finish put James Hunt on the board after just two races, the Brit becoming the seventeenth scorer of 1973. Lotus-Ford Cosworth returned to the top of the International Cup for Manufacturers' standings after Peterson's victory, completing the first half of the season with a one point advantage over Tyrrell-Ford Cosworth when dropped scores were applied. McLaren-Ford Cosworth were a lonely third at the halfway stage, the only other team to have tasted victory in 1973, while Ferrari just held onto their advantage over Brabham-Ford Cosworth for fourth. At the foot of the table, meanwhile, Tecno were overhauled by March-Ford Cosworth, courtesy of the former marque's better form throughout the season.